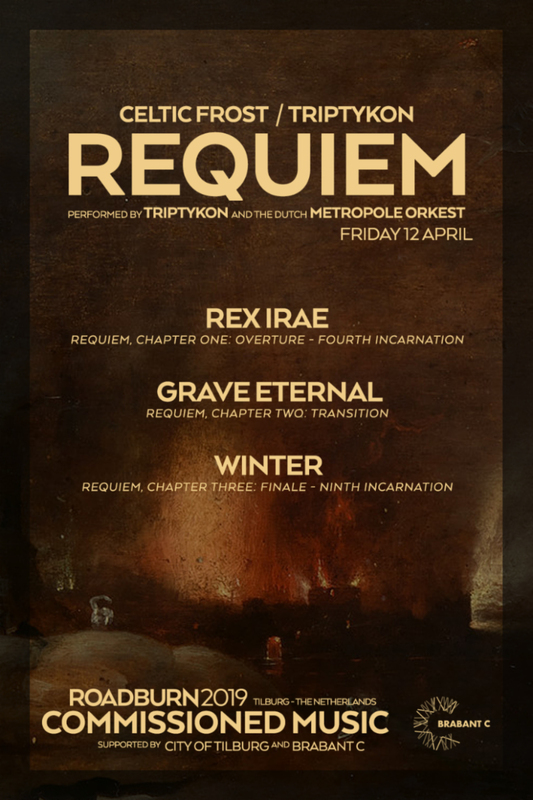 Triptykon, the dark metal band helmed by Tom Gabriel Warrior, will be performing a full orchestral rendition of the complete Requiem at the Roadburn Festival 2019. With the orchestration congregated by esteemed classical arranger Florian Magnus Maier and funding and resources provided by Roadburn founder Walter Hoeijmakers, this marks the first occasion in which Warrior’s full three-part composition will be heard. For this performance, Triptykon will be joined by the renowned Dutch Metropole Orkest to bring the full breadth and power of Warrior’s vision for the “Missa Pro Defunctis (Mass For the Dead)” to life. Celtic Frost was once again laid to rest in 2008, becoming permanent with the death of bassist Martin Eric Ain in October of 2017. “Nonetheless, the intention to finish the full Requiem remained with me,” Warrior continues, “I was going to do it one distant day with Triptykon, the group I formed to continue to pursue the path I began in Hellhammer and Celtic Frost.” He also acknowledges the generous support of Brabant C and the City of Tilburg, Netherlands, where Roadburn Festival will be taking place and where Triptykon will exclusively perform the Requiem on April 12. Triptykon is also scheduled to make festival appearances at Decibel Metal & Beer Festival in Los Angeles, Madrid is the Dark Festival in Madrid, Spain, and Eindhoven Metal Meeting in Eindhoven, Netherlands throughout December; the band will also appear at the Dark East Metal Meeting in Munchen, Germany in April. A full listing of live dates can be found on the Triptykon website.